You are here: Virgin Islands News Online » News » It’s Christmas time again! The main messages were to reflect on the true reason for the season and to think of the less fortunate persons in the Virgin Islands and further afield and to find ways of helping their situation. “We hear in the news everyday of difficulties in places like Syria, Iraq, Afghanistan, and we know of in the recent past we have had real tragedies…. like in the Philippines, where tonight many persons don’t have shelter or may not have food. So we want to remember them in this time of peace and giving and find somewhere or another to contribute to their lives to make it a more peaceful and better life,” encouraged Minister for Communications and Works and Fourth District Representative, Hon. Mark H. Vanterpool. Hon. Vanterpool also sent out greetings to all in the Virgin Islands on behalf of government and his own family. He also noted that Premier Dr The Honourable D. Orlando Smith was somewhere between London and Brussels. Notably absent was Acting Governor V. Inez Archibald who was said to have been affected by a conflict of schedule. 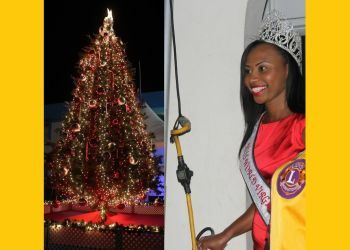 The lighting of the Christmas tree was organised by the Lions Club of Tortola in collaboration with the British Virgin Islands Christian Council. “It is always a great time for visitors and residents alike to gather in a fun setting to greet one another and get the holiday celebrations off to a really great start. As a Christian community it is the time that we commemorate the birth of the lord and saviour Jesus Christ, the son of God. This is why the event has the support of the BVI Christian Council,” noted Hon. Vanterpool, who added that the event precedes another highly anticipated event, Christmas on Main Street scheduled for next Friday and Saturday. 2nd Vice District Governor, Lion Marvin Grant also echoed the call for persons to keep in mind the true meaning of Christmas and to reach out to others in difficult situations. Yuletide Greetings were also given by Zone Chairman 2A, Lion Norval Young, Lion President Vanessa Simon and Leo President Celine Thomas. Miss World BVI Kirtis K. Malone then did the flicking of the switch to light up the Christmas tree. Following the lighting of the tree, performances were given by the St Williams Catholic Choir, Mrs Lelani Stevens-Roberts, Jane Estridge, Kirtis Kassandra Malone, National Boys Choir, Kene and Friends, Jana Penn and Company and the Leo Club of Tortola among others. I am glad you know what ugly looks like now. So next time you look at yourself you know what to expect. So where is Ms. BVI?????? Is either you are a bigger idiot that I thought or you prejudice We all know she is no longer miss bvi. For you information there is a new Miss BVI in Town. Hope you learnt a lesson today. Kids are not kids for long these days, that man should be ashamed of himself, let the children believe in the magic of Christmas and Santa while they can. His congregation should be furious at him. If he only had the sense to understand there is more truth in the story of St.Niclaus (Santa Claus) than his whole religion! But them really got it out for you girl. I guess this indigenous thing really touch them nerves since them got you in hiding!